The National Democratic Opposition Parties in Bahrain demanded the regime to stop its dangerous violations against the citizens. The opposition parties demanded the regime to immediately start implementing the recommendations of both the Bahrain Independent Commission of Inquiry and the United Nations Human Rights Council, to thus, ease tension on both the political and security levels and prevent instability in civil peace. The opposition parties said in a statement issued Tuesday, on the 42nd anniversary of Bahrain's independence, that the Bahraini people have struggled until they achieved independence for their country from the British mandate forces in 1971 pursuant to the memorandum of the British High Commissioner which stated to end the active treaty relations between the United Kingdom and the State of Bahrain given that the treaty contradicts with a fully independent and sovereign state. The memorandum also stated the end of the 23rd December 1880 and 13th March 1892 treaties between the two states. We launched this website on Saturday afternoon, to offer a central space for news and information about current events in Bahrain ahead of tomorrows Tamarrod protests. Within 24 hours hours of our launch, we began receiving messages from Bahrainis telling us that the site had been blocked in Bahrain. Despite the best efforts of a technical assistant, we have been unable to provide a working link for those inside Bahrain. As a voluntary project with limited capacity, we sadly lack the means pursue this further. 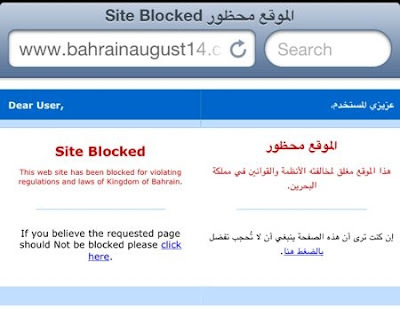 bahrainaugust14.com therefore joins a long list of websites banned by the Bahrain government, including the Bahrain Center for Human Rights, Bahrain Justice and Development Movement, and even at one point the United Nations "WebTV" site. 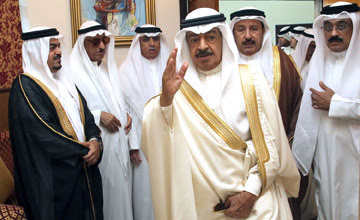 In 2006, the government banned access to Google Earth after activists began circulating satellite images showing the disparity between the palaces and land belonging to the ruling AlKhalifa family, compared with the cramped conditions of many villages. Do not change. Be strong because the world does not respect the weak. Crying and pleading are actions of the weak. Begging will not return our rights, but will only make it more difficult and complicated to move. Steadfastness and insistence on the demands, our principles and values​​, struggle and sacrifice are the factors that will return our rights sooner or later. We should unify our ranks across all spectrum of society and should not surrender to sectarian schemes. With our solid determination and strong will, and our weapons of peace, we will beat their deadly weapons. We should all multiply our efforts to empower each other in everything and we should all strive to be human rights activists, journalists, writers and artists to support our just cause. We need to expose to the world the injustices that the system practices on us, and the repression and brutality that it uses to confront the fair demands of the people. 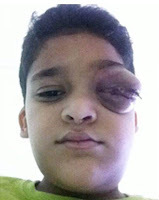 According to Al Wefaq National Islamic Society, a 10-year-old Bahraini child has died, whilst seeking medical care for cancer of the eye, reportedly sustained from a tear gas attack on his home. The home of the boy, Ali Jaffar Habib Ibrahim, came under heavy tear gassing in October 2012 during an attack on Malkiya Village, to the west of Bahrain. According to the family, the Grandfather of Ali Jaffar, died from a chest infection shortly after the incident occurred. Two weeks after Ali Jaffar began to suffer from irritation in his eye and after seeking treatment both in Bahrain and abroad, the family learned that he had developed cancer in one of his eyes. After months of treatment, Ali Jaffar passed away as a result of the cancer last week on 8th August. Ali Jaffar's Father explicitly blames the security authorities in Bahrain for the death of his child and his Father, according to Al Wefaq. The family has requested an investigation into the death, as well as the ingredients and side effects of the tear gas used in Bahrain. The government is responding to the prospect of widespread dissent with a predictable reach for the Repression Button. 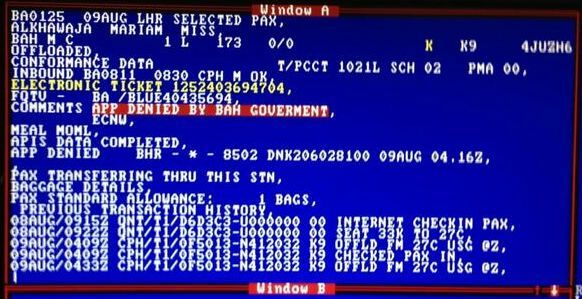 Bahrain Deports U.S. Teacher for "inciting hatred against members of the Royal Family"
Bahrain has deported a US citizen who was working as a teacher in Riffa. The Washington Post reports that the woman, Erin Kilbride, from Portland, Maine, arrived back in the US on Saturday. She also works as a co-editor of online publication Muftah. Bahrain's News Agency (BNA) claims that she was been deported from the Kingdom following findings by the Ministry of State for Communications that she had published writings on social media as well as other "activities linked to radical Opposition groups". In the statement, she is accused of writing "under an undisclosed pen name" and "working illegally as an unaccredited journalist". To date, Kilbride has not made any public comments on the matter. The Minister for Communications took to Twitter to comment on the story. In a series of tweets, he congratulated his staff for identifying the anonymous social media account that Kilbride was using. 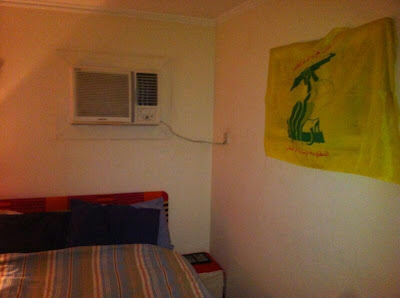 He also tweeted a photograph which he claims shows a Hezbollah flag hanging in her bedroom, over what appears to be a framed picture or poster (see image above). Pro-government accounts on Twitter have gone further - posting pictures of Erin and making additional allegations against her. This island will burn to a cinder all those who seek to tamper with its security and stability. All we want is that all citizens across Bahrain’s cities and villages participate effectively in efforts to implement the recommendations approved by the National Assembly. The focus is on Bahrain now because it is the gateway for other countries in the region, and we have to foil such desperate attempts. We will not accept to let our country be subjected to chaos and destruction, like other countries. Blogger Mohamed Hassan (known on twitter as @Safybh) has reportedly been subjected to torture in detention. His lawyer, AbdulAziz Mosa informed BCHR that he was able to see marks of beatings on Hassan’s arm, and that Mohamed stated that he was beaten at the Criminal Investigation Department on his back and lower abdomen. Hassan made this statement during the interrogation session at the public prosecution that started at approximately 2:30 am on the 7th of August and lasted for more than 3 hours. Hassan said that he was forced to confess under mental and physical coercing. Hassan was interrogated about his online activities, participation in seminars and forums outside Bahrain, and his contacts with media reporters who visit Bahrain. Blogger Mohamed Hassan was arrested from his home at around 3am on 31 July 2013. He was held incommunicado for over three days with no access to family or lawyer. On 3 Aug he was transferred to the Dry Dock Prison. The first Decree promulgated by the King drastically alters Bahrain’s 1973 public gathering law by imposing sweeping limitations on freedom of expression. In addition to the previous prohibition imposed in Article 11 of the 1973 law, which contains a ban on “marches, demonstrations or sit-ins before sunrise or after sunset” without special governmental authorization, the decree adds a ban on all “demonstrations, marches, rallies, or sit-ins in the capital city of Manama,” unless “special permission” is obtained from the head of Public Security. The new ban also covers marches and gatherings that are being held at or “near” hospitals, airports, shopping malls, or other “places of security”. The latter category has been left open for the Interior Ministry to determine. The use of vehicles in any form of gathering has also been prohibited in an apparent bid to limit the mobilization of protesters. 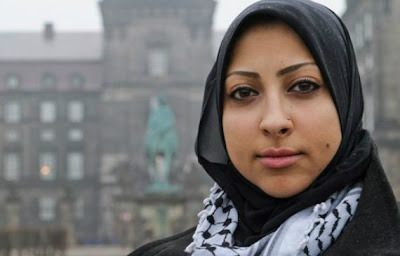 Maryam AlKhawaja is the Acting President of the Bahrain Center for Human Rights (BCHR). The President, Nabeel Rajab, is a current prisoner of conscience. Maryam's father Abdulhadi AlKhawaja and sister Zainab AlKhawaja are also current prisoners of conscience. Maryam has been living and working in exile since 2011. On Friday, she will return to Bahrain. She is expected to arrive at 7:05pm Bahrain time. In a statement, BCHR said: "Maryam Al-Khawaja has chosen to remain in self imposed exile due to the necessity of being abroad for her work and for safety and security reasons. While the same security and safety concerns are still valid, Al-Khawaja finds it necessary to make this trip at this specific time." 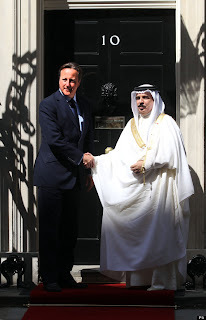 King Hamad met with British Prime Minister David Cameron for talks at 10 Downing Street, in an unannounced visit on August 6th. Details of the meeting are scant, however Bahrain state media revealed that amongst the topics of conversation was the potential sale of Typhoon warplanes to Bahrain. Reuters followed up and obtained this statement from British arms company BAE Systems who are one of the manufacturers of the the Eurofighter Typhoon fighter jets: "Bahrain has expressed an interest in Typhoon and the British government are leading very early discussions; BAE Systems is supporting the government in these discussions." We are concerned about the recommendations made by the National Assembly’s extraordinary session which was recently held to discuss toughening punishments under the 2006 Law on the Protection of Society from Acts of Terrorism. These recommendations include increasing detention period or revoking citizenship of anyone found guilty of committing or inciting an act of terrorism. They also provide for banning sit-ins, rallies and gatherings in the capital Manama. On 31 July, a royal decree was issued to amend the above-mentioned law in accordance with these recommendations. While recognizing the responsibility of States to maintain law and order, we remind the authorities that any measure should respect international human rights standards. 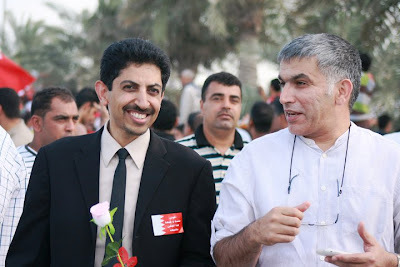 Leading human rights defenders Abdulhadi AlKhwaja (left) and Nabeel Rajab (right). Both are currently prisoners of conscience. Abdulhadi AlKhawaja is an internationally renowned human rights defender. In 2011, he was violently arrested from his home, severely tortured, and sentenced to life imprisonment before a military court. Despite international pressure calling for his immediate release, the sentence against him was upheld at appeal. This evening Abdulhadi delivered a message from Jaw Prison where he remains a prisoner of conscience. In it, he calls "for a peaceful Tamarrod on August 14th [...] under the banner of 'Right to Self determination'." I am a rebel prisoner therefore I support calls for a peaceful "Tamarod" (rebellion) on 14 Aug against tyranny and oppression, considering it as a movement which transcends political and religious affiliations lead by youth with human rights as the common ground under the banner of "Right to Self determination" which can be achieved via an elected national conference representative of all. At an emergency meeting of the National Assembly on Sunday 28th July, members made a series of recommendations relating to national security. The recommendations were quickly condemned by local and international NGOs as violating human rights and giving legal cover to further repression. New National Assembly recommendations could return Bahrain to "martial law"
On Sunday July 28th, Bahrain's National Assembly was recalled by King Hamad for an emergency session "to discuss toughening penalties [...] with respect to protection of the Community against terrorist acts". Analyst Emile Nakhleh described the meeting as "a spectacle of venom, a display of vulgarity, and an unabashed nod to increased dictatorship". The session ended with the members making 22 recommendations. Only one member, MP Osama al Tamimi, voted against them. The following day, King Hamad wrote to the Prime Minister and asked for “essential speedy implementation of these recommendations”. The BBC wrote: "The recommendations if implemented in full would effectively return the country to a state of martial law." The National Assembly in Bahrain consists of two chambers - the Council of Representatives (lower house) and the Consultative Council (upper house). Each has 40 seats. The Consultative Council is entirely appointed by the King. The Council of Representatives is an elected chamber, however it has been boycotted by opposition MPs since the 2011 crackdown. Furthermore, many largely "opposition" districts in Bahrain are subject to severe gerrymandering. One lawyer, Abdulla AlShamlawi, has claimed that the emergency session was unconstitutional, as the existing provisions only allow for the chambers to be recalled separately. He argues that "there is no constitutional provision which authorizes the invitation for the National Assembly with its two chambers."